A few sites in BC, Canada. For plant details see e-Flora BC website. Use http://plants.usda.gov Plant Images to find map of states where this occurs, then can click on state to view counties within each state. Peterson Field Guide and Baird’s descriptions mixed: V. septentrionalis similar to V. sororia, leaf shape cuneate like sororia, but three lowest petals densely bearded at base. Pubescent petioles and peduncles. Sepals finely ciliate. Leaves often purplish beneath. Flowers violet. Capsule reddish purple, almost spherical. Open conifer woods, Canada south to Wisconsin, Michigan and New York, New England; in mountains to Virginia. Flowering May-June. 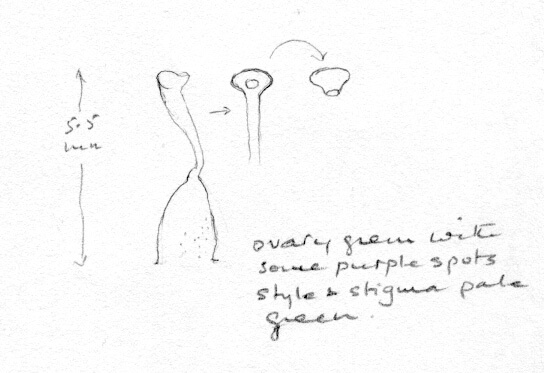 From plants in lawn, Small Point, Maine August 18, 06, seed pods purple on short peduncles (like V. affinis), mature seeds taken from an opening pod were very pale cream to pale olive with glandular spots all over the surface, 0.9 x 1.75mm, large colourless elaiosome to half see length, very similar to description for seeds of V. novae-angliae. More similar to affinis and novae-angliae with three lowest petals bearded and pale mature seeds, cf. sororia seeds are very dark grey to black. However, seeds of V. affinis are pale cream where those of novae-angliae and septentrionalis are more olive. Novae-angliae seeds olive, septentrionalis are paler. 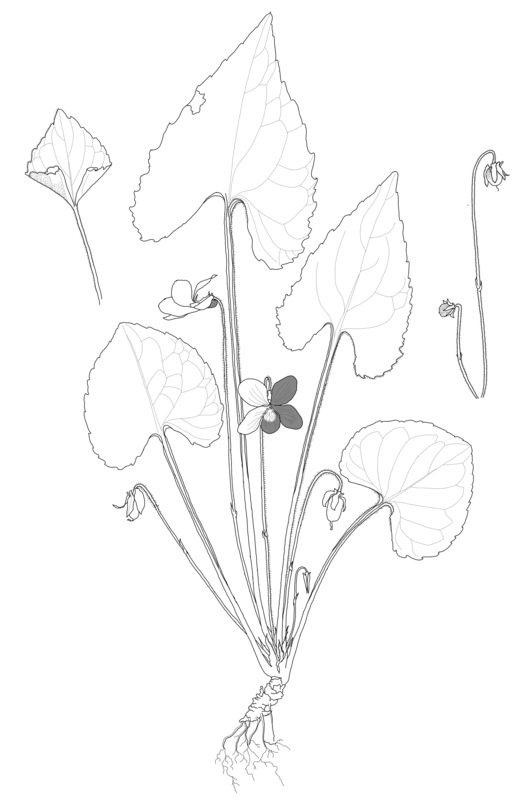 Late May, 09: Viola septentrionalis was flowering in profusion on the ski slopes of Mt. Tecumseh in the White Mountains, though a large patch of plants were infected with Cucumber Mosaic virus. 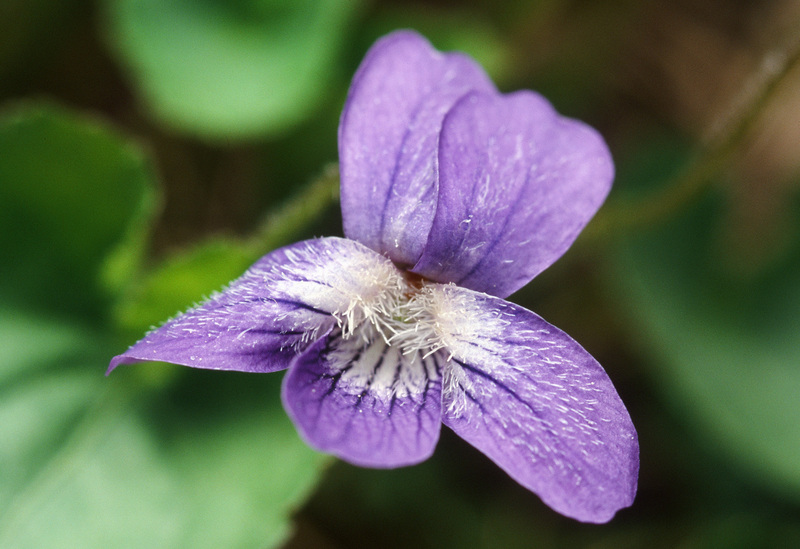 Viola septentrionalis has now been included with Viola sororia. This last was very interesting because if has hairs on all the five petals and the hairs glistened in the sunlight. Also the petioles, peduncles and the sepals are all hairy. It was growing in moist soil under full sunlight, with only grass for competition. 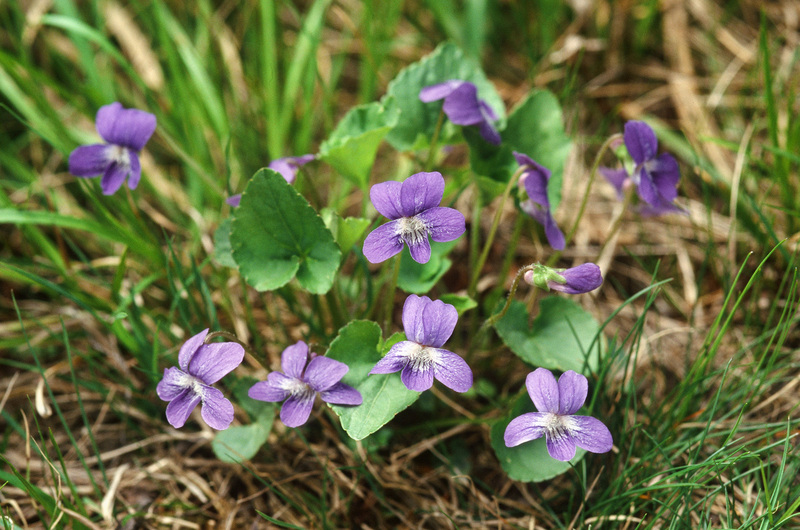 Viola pallens also grows nearby but in slightly wetter positions. NH, 1850 feet, granite. There are a few plants of V. septentrionalis at Shenk’s Ferry, at the end of the level walk before it meets the railway line overhead. The soil changes here to a mica-schist base. The area is very cold because cold air is venting up through the spaces between the rocks from underground. The plants have dark purple-red flowers, bearded on the lowest petal, large white ‘eye’ in flower centre, petioles and peduncles very pubescent, leaves long-ovate, much longer than V. sororia. Very southern location because of constant cooler conditions during spring, summer and autumn. Check sepal margins for cilia. 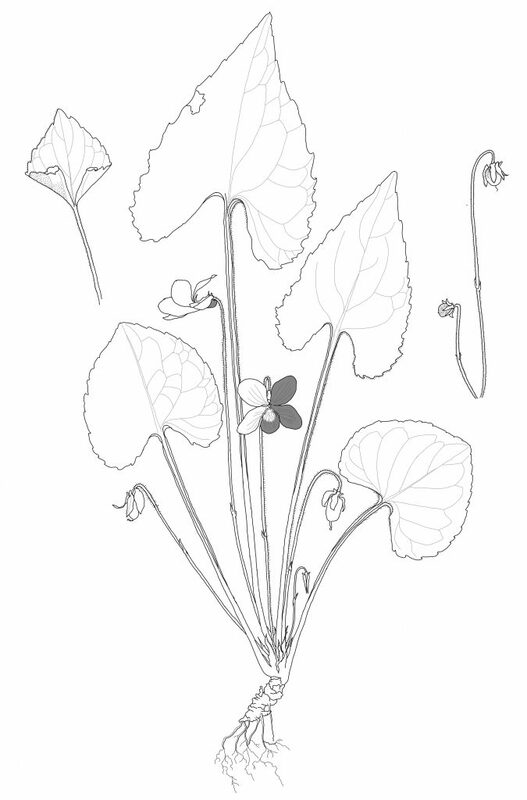 Ezra Brainerd (1904) said rich violet of the petals and purple coloring on the lower surface of its earliest leaves, characters that fade after a few months n herbarium sepcimens. However the fine ciliation extending nearly or quite to the tip of the sepal margins is characteristic. 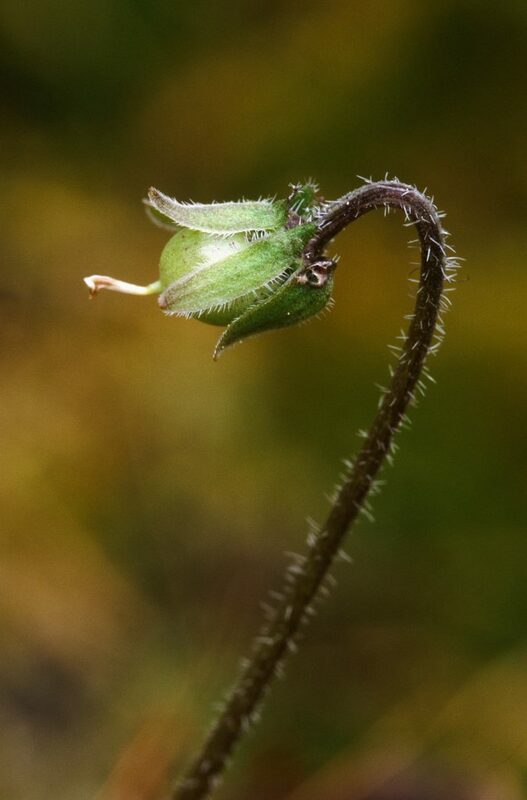 In Viola sororia the sepals are obscurely ciliate and that chiefly at the base. In late summer, Viola septentrionalis is seen to be more closely related to V. sagittata var. ovata than to any other species. This is seen in the pubescence, in the color of the petals, in the form of he apetalous flowers and fruit, and in the ciliation and long auricles of the sepals. It especially affects the company of young conifers, and thrives in the open groves of arbor-vitae that abound on the rocky shores of Lake Champlain.